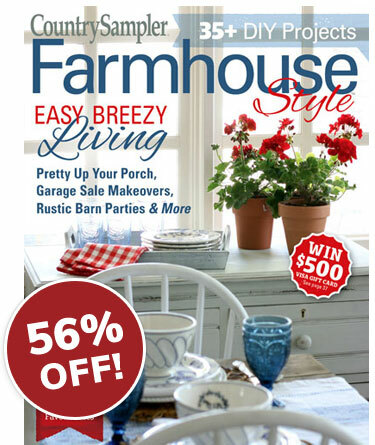 subscribe to Farmhouse Style magazine today! If at any time you're not absolutely delighted with Farmhouse Style, just let us know. We'll promptly refund every penny you paid. No questions asked. In the pages of our new magazine, we're going to bring you wonderful down-home tips, ideas and inspiration for creating the farmhouse-style home of your dreams! Plus, we'll share the simplicity and charm of the farmhouse life. Kay, a reader of our first Farmhouse Style issue, shared that our magazine is a reflection of all the things she holds close to her heart as she recalled summers spent on her grandparents' farm picking berries, making cornhusk dolls and savoring the memory of cinnamon buns rising on the potbellied stove. She added, "DO NOT change a thing! The magazine is everything I could want a magazine to be: projects, recipes, articles and so much more!" Well Kay, we're not changing a thing; in fact, we're bringing you more! 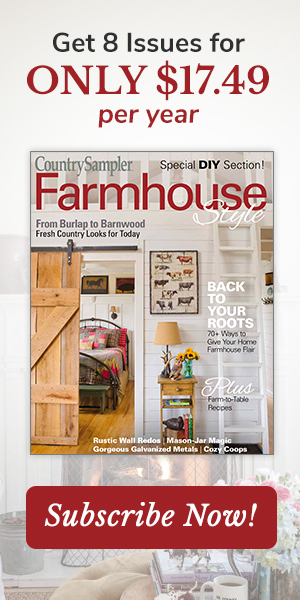 Now, with four issues a year, you'll find an abundance of farmhouse home tours, DIY projects, delicious recipes and tip-filled articles to immerse yourself in the farmhouse life. When you browse through Farmhouse Style, you'll almost hear the crunch of hay under your feet, feel the fresh breezes in your hair, and smell those cinnamon buns rising on the stove -- even if you live in a suburban ranch home near the city. Because we understand that the love of farmhouse style is not confined by geography; everyone can enjoy it, from urban dwellers to those who live in the small towns dotted across the country. Welcome to our new Farmhouse Style family! 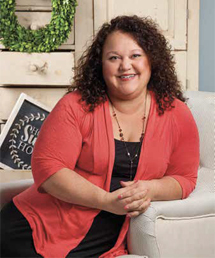 Farmhouse Style and other companies.